As more of our reading moves from print to screens, learning how to write on the Web will become an increasingly important part of history writing skills. Just as we teach fundamental research and writing skills for print essays, we will likely begin to teach digital writing skills for the Web. Writing for the Web will also become an important component of teaching public history (as it has already). These are some of the assumptions that have informed my current course on the history of Toronto at York University. I have asked students to write a Web essay for their Fall semester assignment, using WordPress on a course site that I set up at DevelopmentofToronto.com. This is not a unique or revolutionary idea. I have known several colleagues who have had students write Web essays and I have had students write optional Web assignments in the past. This is the first time that I will be asking all students in the class to write Web essays. As such, it is an opportunity to think about how to teach specific Web-based history writing skills. As with traditional print essays or articles, fundamental history research and writing skills should still apply to writing on the Web. I will still require my students to conduct original primary source research, contextualize that research with high-quality scholarly secondary sources, and situate their arguments within the relevant scholarly literature. Their writing should still be clear, well-organized, and persuasive in its argumentative structure. The writer should present evidence in such a manner that conveys to the reader adequate context, chronology, and a sense of change over time. Writing should be free of grammatical errors. Again, this is often something I try to stress for print essays, but the imperative to write in an accessible manner is all the more significant when writing on the Web for a broad audience. The assignments students write for history courses in university are generally intended for a single reader, the instructor. A Web essay potentially has a much broader audience. This affords the opportunity to teach students about how to think of their audience when writing. I wrote about this idea in a blog post a couple of years ago here. Writing on the Web provides historians with the opportunity to place their research sources directly before the reader through hyperlinks. With the abundance of digitized historical primary sources now available online, historians can link directly to the sources rather than just simply providing breadcrumbs in their footnotes. As I demonstrate below, when possible, historians should link their footnotes directly to their sources online. Rather than chasing down a copy of Orwell’s “Politics and the English Language” to confirm the accuracy of my citation or to consult the complete source, history on the Web can bring readers to the source immediately. With the growing abundance of online storage options and institutional digital repositories, we may one day require graduate students to upload digital copies of all of their research materials to be linked directly to the footnotes/endnotes in their dissertations. This approach to citation on the Web can bring research to the forefront and expose the work of historians in stitching together complex narratives from disparate historical documents. It unveils, in part, the historian’s craft, but in ways that might strengthen scholarship and better facilitate future research and knowledge production. My link to Orwell’s essay below might be the beginning of a new research project for another scholar or support ongoing work. Writing history on the Web obviously creates new opportunities to incorporate visual sources into research and presentation. If you have ever flipped through the pages of an old dissertation and come across a photograph awkwardly pasted onto one of the pages, you know how far we have come with the integration of visual sources into historical research and writing. History on the Web can (and probably should, when possible) include large, high-resolution, and full-colour images. If a Web article is focused on the interpretation of visual historical sources, rather than including just a few examples of those sources, the historian can include a complete slideshow of all visual sources that she/he analyzed. 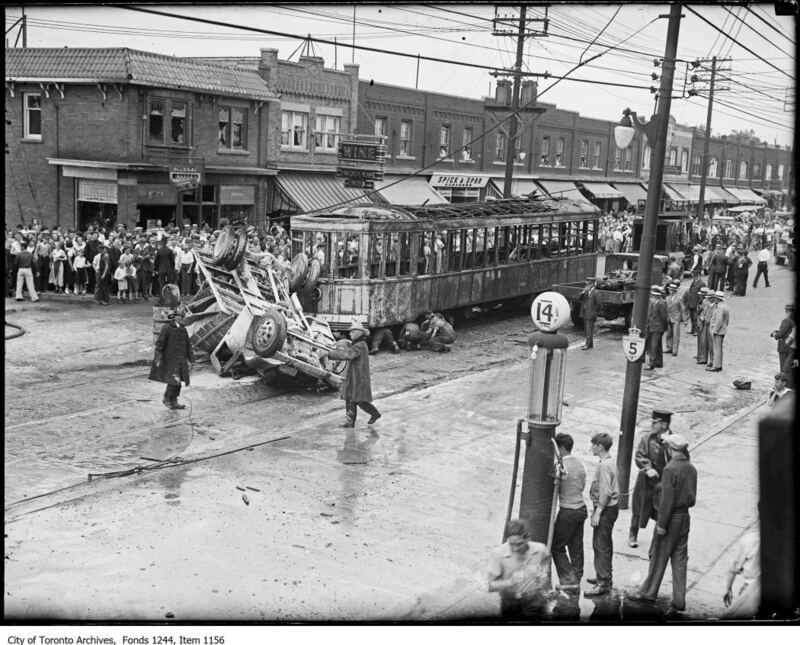 Clicking through to this large-format image, readers can see not only that a streetcar collided with a truck, but that emergency workers were still struggling to retrieve something (or someone) from beneath the vehicle. They can also see that the truck and streetcar caught fire. The shock and excitement of this event can be read on the faces of the by-standers lining Danforth Avenue, including the young children standing at the front of the crowd. And if they want to access this image from the City of Toronto Archives, they can click on the image and go directly to the source. Again, this is a type of visual source that can be used both for research and presentation in ways that are not possible in print. Finally, I think writing history on the Web should integrate audio and video sources, when possible. Oral history is an increasingly important part of historical scholarship. With permission from the interviewees, a historian could include audio or video clips from her/his oral history work in a Web essay. The complete archive of oral history interviews could also be linked to the essay online. This would provide an incredible resource for future researchers. I am looking forward to seeing what my students come up with for their Web essays for DevelopmentofToronto.com later this year. There are numerous possibilities for history writing on the Web and I would also love to hear from readers of Active History about their own approaches and best practices. Please leave your ideas and suggestions in the comments section below. Sean Kheraj is an assistant professor of Canadian and environmental history at York University. He writes at seankheraj.com. George Orwell, “Politics and the English Language” Horizon (April 1946): 264.